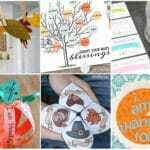 Celebrate Friendsgiving and your favorite Thanksgiving Friends' episodes with these free printable food illustrations. 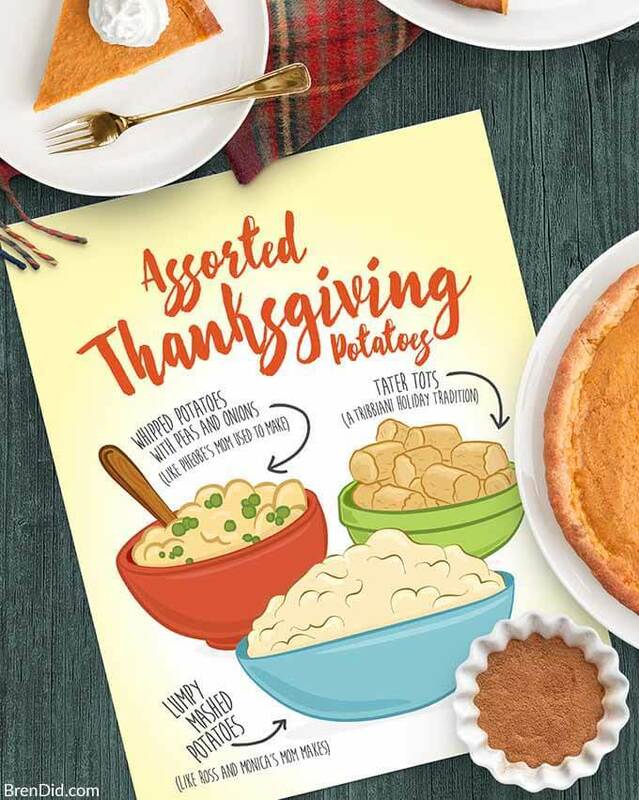 Each print features a hilarious food drawing and quote inspired by the beloved TV sitcom and it's (often absurd) Thanksgiving feasts. 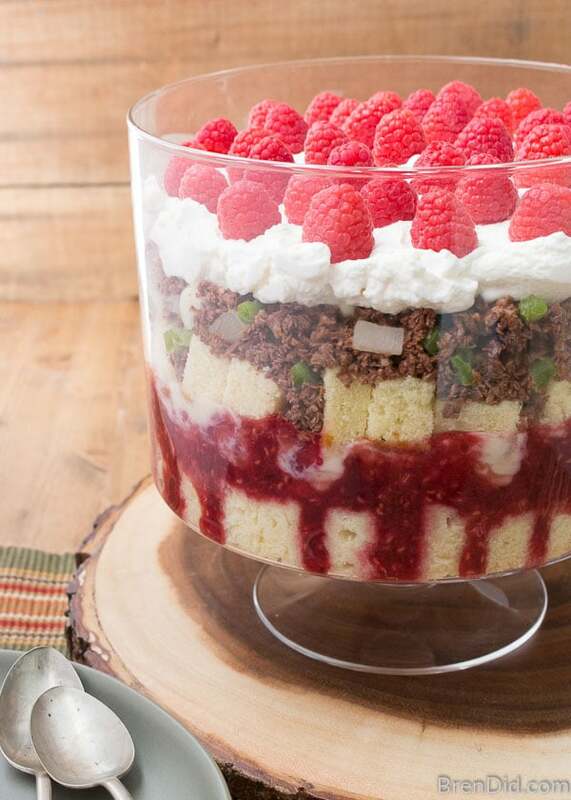 The one with the meat in the trifle! The one with all the potatoes ! The one with Chandler’s terrible childhood memories! The Friends gang had a way of making their annual Thanksgiving dinner memorable… and the food terrible. 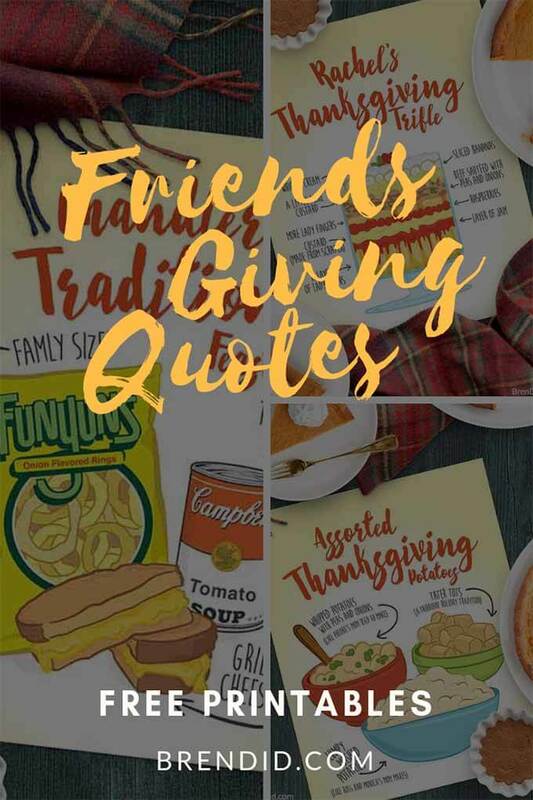 These free printable quotes are perfect for celebrating Thanksgiving, for dressing up your Friendsgiving meal, or for bringing a smile to the face of your favorite Friends' fan. I love all 10 of the Friend's Thanksgiving episodes, but I'm especially fond of the foods served in The One Where Underdog Gets Away (Season 1) and The One Where Ross Got High (Season 6). 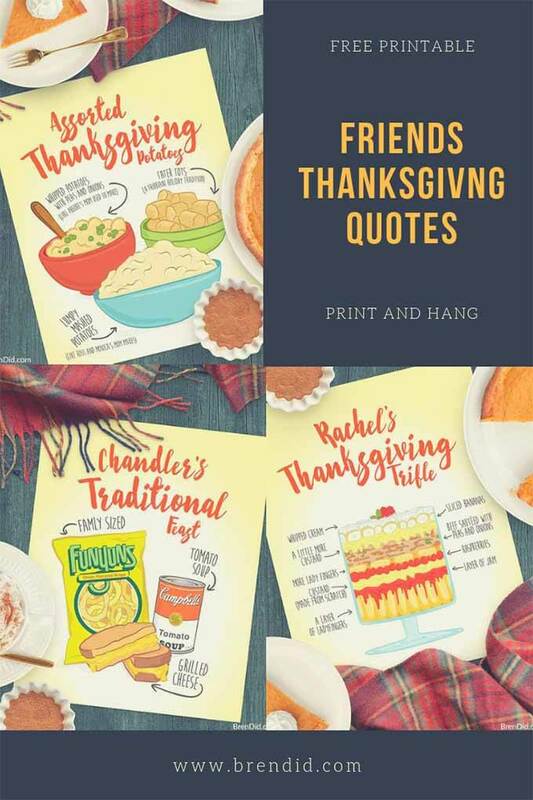 Plot – In the very first of the Friends' Thanksgiving episodes, Monica cooks the gang a Thanksgiving meal because the Geller's are out of town, Joey's family is embarrassed over his venereal disease advertisements, and Rachel can't get to Vail for her family's skiing trip. 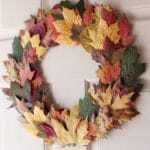 On the Menu – This classic Thanksgiving meal features three kinds of mashed potatoes (mashed potatoes with lumps for Ross, tater tots for Joey, and whipped potatoes with peas and onions for Phoebe. 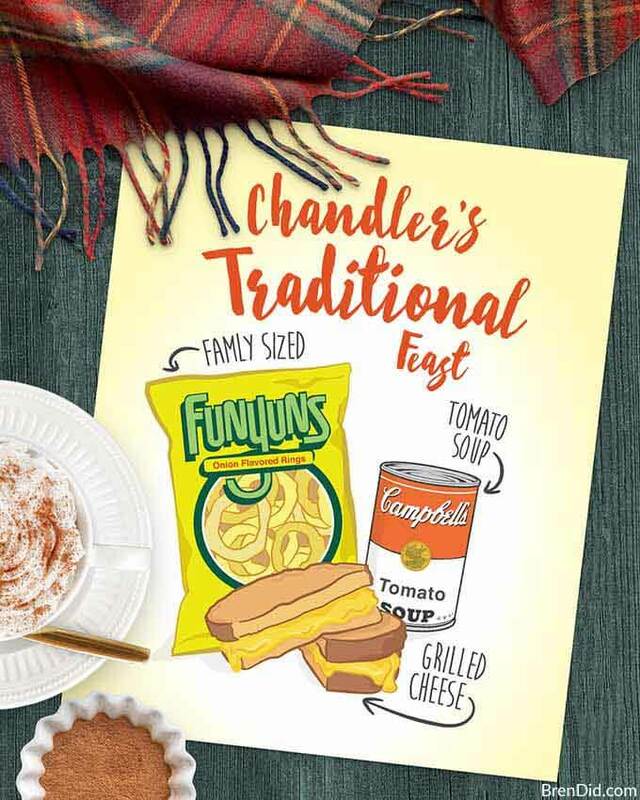 Everyone shares Chandler's traditional Thanksgiving dinner (tomato soup, grilled cheese and Funyuns) when they are locked out of the apartment and Monica's feast burns. 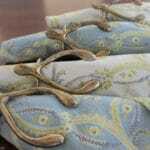 Plot – Too many secrets are revealed to the Geller parents in this classic episode. 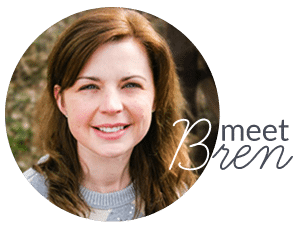 Rachel wants more responsibility and takes over dessert with disastrous results (she accidentally combines the ingredients for a traditional English trifle with Shepherd’s pie). 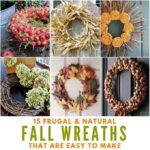 Grab the free 8×10 posters in the free printable library for the perfect Friendsgiving decorations. Tip: I printed my illustrations on matte photo paper , it is thicker than copy paper and prints with extra bright colors. 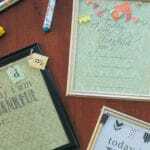 This makes a sturdy pictured that can be framed or simply taped to the wall with a bit of colorful washi tape. 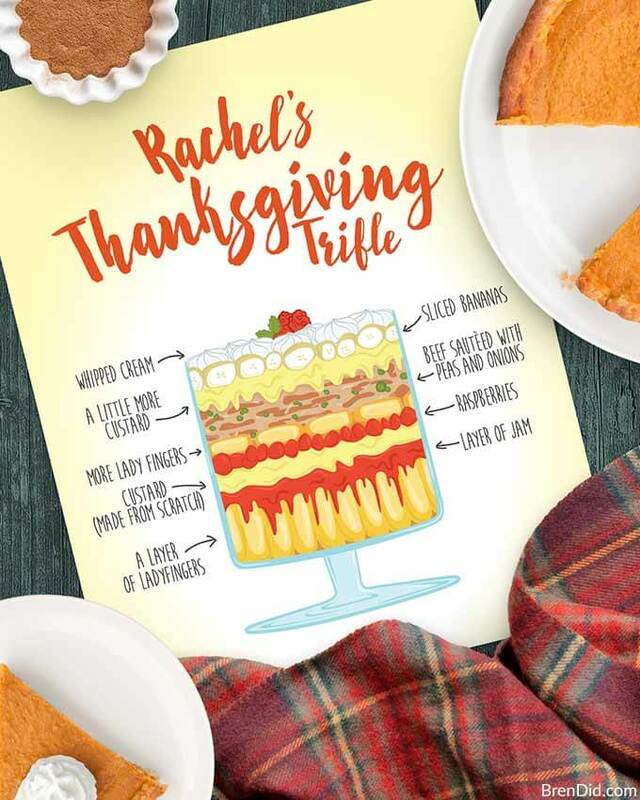 Delight (and terrify) your guests with my delicious version of Rachel's Thanksgiving Trifle. The ” beef sautéed with peas and onions” layer is made from chocolate and fruit… but it looks realistic enough to scare everyone! 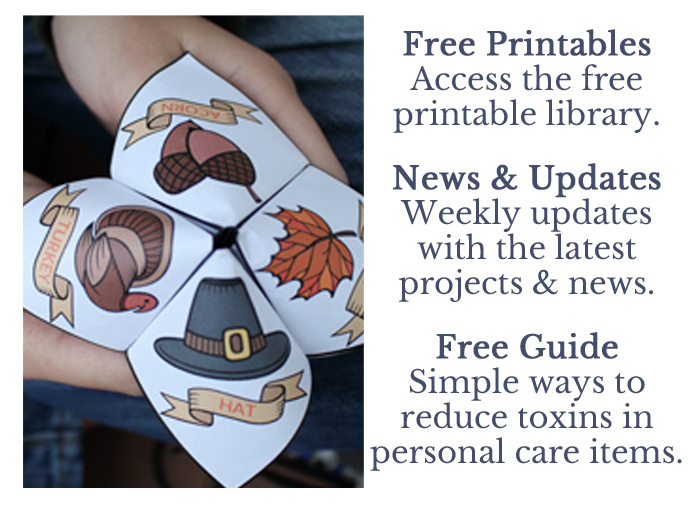 I hope you enjoy these free printable illustrations for Thanksgiving. 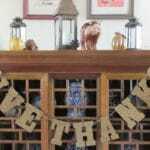 Your guests will appreciate a little Friendsgiving humor AND the memories of their favorite Friends’ episodes.